Prequel to the first Missing In Action, set in the early 1980s it shows the capture of Colonel Braddock during the Vietnam war in the 1970s, and his captivity with other American POWs in a brutal prison camp, and his plans to escape. For many years I have enjoyed Chuck Norris. Now I can say that one of his movies made me cry. This movie was an absolute heart-stopper, tear-jerker, and gut-wrencher. This is a total psychological flick, exposing to the viewers the horrors of Asian prison camps. Of course, Norris busts out in the end with his comrades. After watching this movie one feels like a true American. If you can't crack open a Budwieser and wear a t-shirt with an American flag on the front you shouldn't watch this movie. This makes me think of Bruce Springstein's Born in the U.S.A. The only thing missing from this movie was Billy Drago, of course. All in all, a worthwile and moving flick to view. Rent it right now, or better yet, buy it. 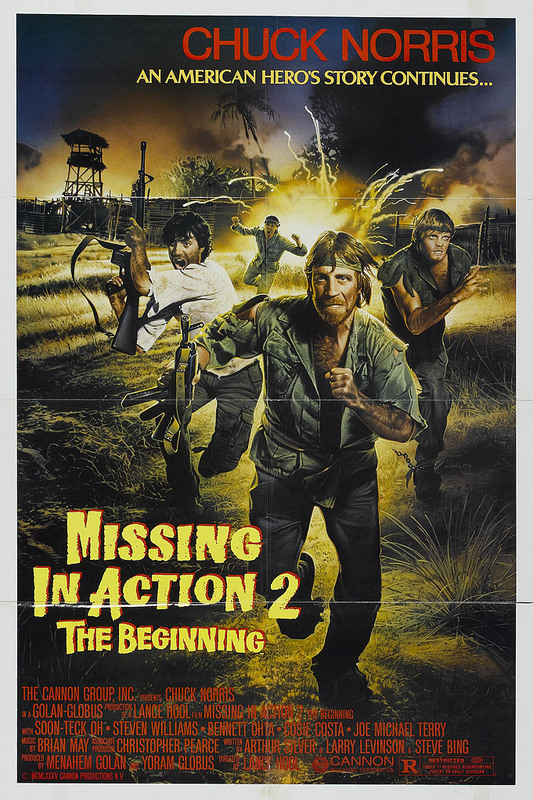 This film is an inferior prequel to Missing In Action. Soon-teck Oh is formidable as the villain we want to hate; he's one of those villains we'd like to strangle with our bare hands after jumping into the screen. The best thing about the film is that it might give you a good idea about what a P.O.W. would have to endure. The problem is the claustrophobic setting. With mostly a single setting, there has to be a collection of much better dramatic actors or comedic side stories to make the movie more compelling in such a setting. As it is, there's over an hour of very little action, just a battle of wills between Oh and Chuck Norris. After that, hang on, there's shooting and explosions galore. The opium subplot goes no where either. There's no good acting support and the script, as in most Norris movies, is a let down again. Highlights are the Norris scene when he's hung by his ankles and the big fight with Oh. Not enough to make it a satisfying action movie. * 1/2 of 4 stars.